When I bought my home, the previous homeowner left behind two Rubbermaid Resin Outdoor Storage Sheds. These are medium-sized two-door plastic storage units that are advertised to stand up to the elements. According to Rubbermaid, the units are water-proof, leak-proof, rot-proof, rust-proof and weather-proof. I have owned my home for almost two years and am down to only one unit. Despite this fact, I still recommend this product. 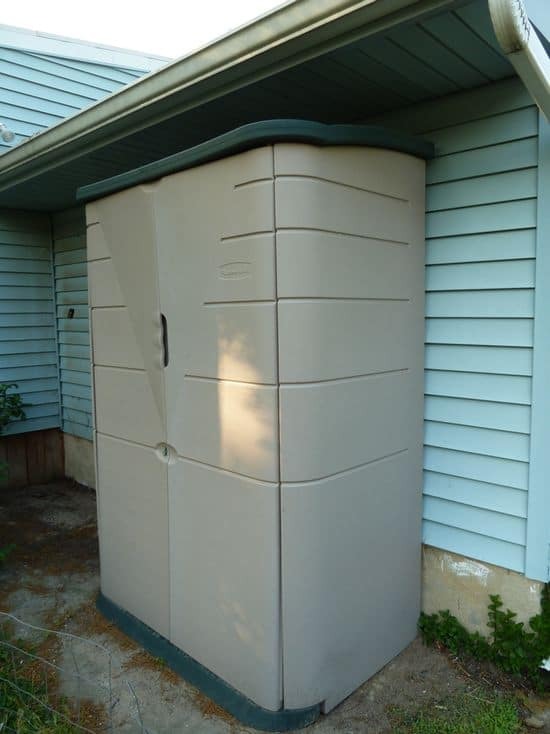 The Rubbermaid Resin Storage Shed is not cheap, but is cheaper than other stand-up storage options. For about $175, this shed features inside grooves that can accommodate homemade wooden shelves (more on this in a bit) and still boasts a larger, open space from the ground up that is spacious enough to hold long-handled tools such as my rake, shovel, and hoe. The inside dimensions measure about 26 inches wide, 15 inches deep, and 67 inches tall. Along with my long-handled tools, I am also able two store two bags of fertilizer, birdseed, and two containers of Preen on the resin floor of the unit with room to spare. This section is ideal for heavier items. The unit’s size and shape is perfect for fitting into tight spaces that a traditional shed, or even a wider floor unit, doesn’t permit. My units were nestled under the roof’s outcropping along the back of the house to provide additional protection from rain, sun, and unwanted visitors. As mentioned before, wooden shelves were inserted into my units. These sit securely within the resin grooves. I have only ever used about 20% of the shelving capacity. In addition, large rubber-coated hooks were added to the upper insides of the unit that are perfect for holding twine, hanging baskets, and short-handled tools. Nothing I have ever placed on the shelves taxed their stability. However, this is also a testament to the individual craftsman who measured and installed the shelves. I am unsure when my units were purchased, but one of them broke during my ownership. The right door no longer swung on its hinge despite drilling a new hole for the upper hinge. This is problematic since the doors lock together to keep the unit closed. On average days I would go out back to find the unit completely open with the door leaning. On windy days, the door entirely blew off, exposing my tools to the elements (quite a few of my tools rusted in this manner), and advertising to my neighbors a free collection of tools and gardening products. While I cannot attest to the ease of assembling this unit, I can comment on its disassembly. The empty unit both slid across pavement and came apart rather easily. Despite Rubbermaid’s claims, it was indeed waterlogged- this made deconstruction somewhat harder and heavier, not to mention messy. The doors, obviously, were quickly detached from the main unit. The rest of the shed came apart with a few pushes and pulls. It did take two people to fully dissemble and I would recommend two to assemble, but one skilled person can probably do the job. The unit is comprised of seven pieces, the top piece being heavy enough that I could only drag it to the curb with assistance. The unit’s doors have a hiddle handle and allow for a padlock. This is advisable, given my experience with the broken door. However, on my existing working shed, I noticed that the loop for which the lock is to be attached is actually cracked all the way through. Therefore, while a lock may provide the look and comfort of security, I doubt how helpful it may be–it seems to me that the lock can be ripped off without effort if an intruder truly wanted the shed’s contents. If shed security is important to you, I would advise against buying this product. The doors on my existing unit are extremely durable, making me wonder how the first unit ever managed to break. The plastic is thick and high-quality. Don’t expect this unit to hold power tools any larger than a trimmer or blower, as it is only 15 inches deep. Do expect this unit to remain sturdy for years, provided doors remain closed during periods of non use to prevent excessive hinge wear and tear. We have one of these sheds. We actually drilled a hole through either side and put a long piece of threaded metal through either side and added a bolt on the outside threads to squeeze the walls together a little. It held up through 4 moves. With the last move, the top kept blowing off. We used construction adhesive and glued the top to it. Since our last move, it has held up 3 years on the southwest side of the house, exposed to wind and elements. Even with the leaning problem (fixed as above) and losing the top in windstorms (also fixed) we really like this shed. I would buy another one if I needed it.